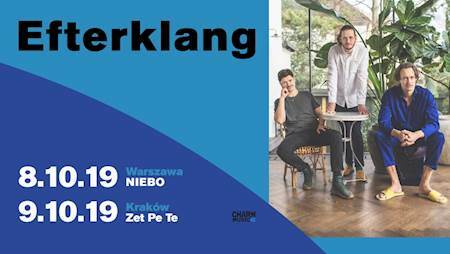 After almost 6-year absence, Danish band Efterklang will return to Poland to perform live. Efterklang tickets on sale now. The concert will feature new and yet unreleased songs (in Danish) as well as much-loved songs from their impressive back catalogue. The trio of Mads Brauer, Casper Clausen and Rasmus Stolberg will be joined on stage by 4 incredible musicians from Denmark, Norway, Belgium and Lithuania who together form the new Efterklang live-band. It has been more than 14 years since the release of Efterklang’s debut album Tripper (The Leaf Label) and nearly seven years have passed for their fourth LP, Piramida (4AD). A constantly innovative and evolving trio, they created an album based on sounds from an arctic expedition, produced films, co-founded festivals and a radio station, and they have performed all over the world including an iconic performance at the Sydney Opera House. When Efterklang performed a spectacular show under the name The Last Concert in 2014, it gave most people the wrong impression the band was over. In truth, the concert marked a new reflective and experimental time for the band who have since released two albums under the moniker Liima (with Tatu Rönkkö), in addition to an opera (‘Leaves’), made in collaboration with composer Karsten Fundal. In 2019 Efterklang will evolve once again.